Accidental spills of hazardous materials, hazardous waste, or petroleum products can have negative impacts on public health and the environment. Business owners that use and store dangerous substances can take steps to prevent spills from happening and should know what to do in case a spill does occur. 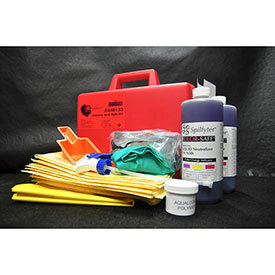 Place this kit in strategic locations for quick response to leaking or spilled battery acid (electrolyte). Ideal locations include garages, forklift storage areas, battery storage areas, etc. It is also effective for cleanup of dry cell batteries. OSHA’s Forklift Standard 1910.178(g)(2) states: facilities shall be provided for flushing and neutralizing spilled electrolyte, for fire protection, for protecting charging apparatus from damage by trucks, and for adequate ventilation for dispersal of fumes from gassing batteries. Provides an immediate solution for many unexpected acid spills. Place in strategic locations for quick response to leaking or spilled battery acid (electrolyte). Also an effective for cleanup of dry cell batteries. Ideal locations include: garages, forklift storage areas, battery storage areas, etc. Color change process lets you know when Acids are safe to handle-Minimize the Risk! Many aggressive liquid spills involve hazardous acids that require a way to render them safe for final clean-up and disposal in accordance with local, state and federal regulations. KOLOR-SAFE® Neutralizers meet this requirement.